BCO has one of the largest land holdings through leases in the state of Idaho; in total over 60,000 acres. These ranches are located in the Hell’s Canyon area, near the famous and picturesque Salmon and Snake Rivers. Access into these ranches is strictly controlled; however, the animals are free ranging and therefore challenging to hunt. The ranches are accessible by 4-wheel drive vehicles, providing easier access to productive hunting areas. These leases have been in place for over 20 years, and coupled with the limited access, our selective deer and elk hunting yearly produces outstanding bulls and tremendous bucks. These large leases allow us to guarantee around 2000 acres per hunter where they will enjoy undisturbed hunting at its finest. 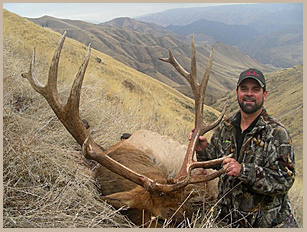 This hunt is very unique in that it is a true trophy hunt for elk, mule deer, whitetail, and bear! This hunt take place is in the Hells Canyon region of north central Idaho at our Joseph ranch (roughly 35,000 acres) and is one of a kind in that we have private land access to some of the most limited access hunting ground in the state. The majority of this unit is private land, which coupled with limited tags results in very little pressure on the herds, allowing the bulls to grow older and thus giving us ample opportunities at big mature bulls on a regular basis. We have been on this ranch for over 20 years now, so we have the experience to understand the herds. This season starts October 10th and runs through November 3rd. We are nearly 100% successful at getting our clients their bull, and easily 100% on opportunities at 6x6 bulls, its just a matter of finding the right bull and getting within range. Each year we will average bulls around the 280-290 mark with many scoring in excess of 300. Every year we will harvest bulls ranging in the 320-350 class, with our biggest bull taken on during this hunt at 387 B&C. These elk are running in herds of up to over 100 during this time of the year, so on many occasions there will be multiple trophy bulls within sight at once. They are still bugling at this time of year so we use that to our advantage for locating the herd bull. Its very common to see 100+ elk a day during this hunt. This area also yields some dandy mule deer as well; 20-24"average and some 26-30" bucks with deep forks that produce racks as high as they are wide make for a memorable hunt and a beautiful trophy. We typically see about a 75-80% success on mule deer bucks averaging in the 140-155 class are very common, with many each year reaching into the 170-190 class with our biggest buck going 201. The elevation on this hunt is in the 1500-4500 range. We also offer hunters to pick up a whitetail tag and a buck can be taken for only a $500 kill fee! Most bucks taken will run in the 130-150 range. Also boasting a healthy bear population, anyone wishing to purchase a bear tag can expect opportunities at mature bears throughout the hunt for only a $500 kill fee. This time of year most bears seen will be ranging in the 250-350 pound range, with about a 50% chance of a color phase bear. 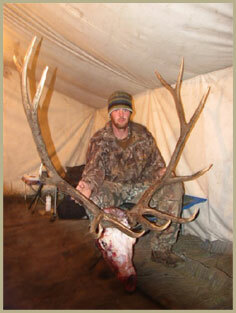 This hunt is a 2 on 1 guided hunt and is 7 days in length. This hunt includes all meals and has all full modern accommodations, including cabins with comfortable beds, a nice lodge with full bathroom and showers. This hunt takes place along the Salmon River/Hells Canyon region of north central Idaho at our Whitebird ranch (roughly 18,000 private acres and a large forest service lease). This hunting unit borders the Joseph camp area; they are just across the Salmon River from each other. This hunt start October 10th and goes through October 24th. We average around 95% success on both animals. On average roughly half the bulls taken on this hunt will be 5x5 or better, and the rest will usually be smaller, more immature bulls. Every year is different and some years the number of mature bulls will be bigger, and some years it will be smaller. The elk are still in large herds of up to 50 at a time, they are still bugling and its nothing to see over 50-100 head in a day. We do mainly spot and stalk for both elk and mule deer on this hunt. The country is very open with large canyons and ridges to work with while on the stalk. Hunters can also add a bear tag to this hunt and harvest a bear for only a $500 kill fee. Most bear this time of year are in the 250-350 pound range, with about a 50% chance of harvesting a color phase bear. This is a 2 on 1 fully guided hunt and is 7 days in length. The accommodations include a lodge, cabins, all with full modern facilities. The cabins have full bathrooms in them, and the lodge has a nice comfy home-like feel to it. This hunt takes place along the Clearwater River region of north central Idaho at our Peck ranch. This ranch is in an area where whitetails are denser then at the Joseph and Whitebird ranches, so therefore we can offer this as a quality elk-whitetail combo hunt. This hunt start October 10th and goes through October 24th. We average 70% success on elk and almost 100% on whitetail. This hunt is very similar to the Whitebird ranch combo hunt as far as the elk goes. Most elk run in the 250-260 range, mostly nice 5x5 and 6x6 bulls, with some reaching 300. The elk are still in large herds of up to 20-40 at a time, they are still bugling and its nothing to see over 30 or more head in a day. We do mainly spot and stalk for both elk and whitetail on this hunt. The country is very open with large canyons and ridges to work with while on the stalk. The bucks tend to fall into the 130-150 range with some reaching into the 150+ class. About 95% of bucks will be nice solid mature 4x4s or 5x5s, with nice tine length and good mass. Hunters can also add a bear tag to this hunt and harvest a bear for only a $500 kill fee. Most bear this time of year are in the 250-350 pound range, with about a 50% chance of harvesting a color phase bear. The accommodations include a lodge, with full modern facilities. The lodge has full bathrooms with showers, and the lodge has a nice comfy home-like feel to it. This remote, rugged area is located within the Selway-Bitterroot Wilderness areas, between the beautiful Selway and Lochsa Rivers in North Central Idaho. The exclusive outfitting rights in the region are assigned to only Boulder Creek Outfitters. In fact, Boulder Creek is one of only three outfitters since the 1920s to outfit in this area, testifying to its ability to produce numerous trophy animals and therefore one of the best outfitters in the country. We have been outfitting in this area for over 30 years now, so our experience in the area and knowledge of the game can assure you we are one of the best at what we do. The vastness of our area (over 600 square miles) and gaming variety allows us to selectively hunt our area, thereby sustaining mature trophy elk and deer. Hunting in this designated wilderness area will be conducted from horseback and on foot. Camps will be wall tents complete with carpet flooring, wood and propane heat, and cots with foam pads for your comfort. This steep and rugged country is at elevations between 2700-7200 feet; therefore, physical fitness will be a factor in your success. Because the area was designated wilderness in 1964, it has never been logged. Physical condition will play a large part in the success of these wilderness hunts. The big mountains combined with the wilderness aspect of this hunt make for a demanding hunt because of the limited accessibility of the area requires us to travel by horseback or by foot only. We may need to travel hours a day from camp to get into good hunting grounds and if we can't push hard the chances of getting into elk can be limited. If a hunter cannot do what is required of them they need to understand that on this hunt they may see a much lower chance of getting a bull versus someone who can hike and hunt hard each day. Please let us know if you are unable to do a great deal of hiking, we will do our best to accommodate everyone on this type of hunt but if physical condition is a question we may look at other elk hunt options. The elevation for this hunt is in the 3500-7000ft range. 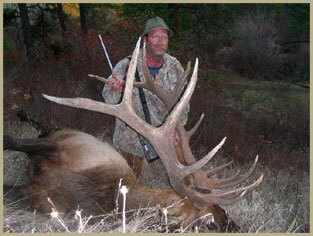 This is such a rare opportunity for rifle hunter; a chance to hunt elk with a rifle in the peak of the rut! We are a select few in the country who have a trophy fly-in rifle bugle hunt. This season is only a little over 2 weeks long, running from September 15th through September 30th. This hunt takes place deep in the Idaho wilderness in the heart of the Selway hunt unit. First off you fly out of a small town called Orofino; from there you have about a 30 minute flight which takes you about 80 air miles deep into the wilderness and land on a beautiful mile-long grass airstrip, where the guides meet you and from there you pack to camp by horses and mules. 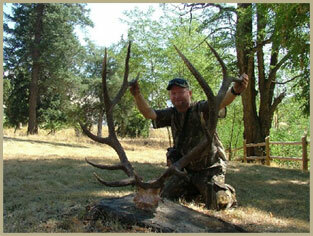 This will be an exciting hunt with elk calling and spot and stalk being the main modes of hunting. The bulls are still rutting hard so hearing them bugling is common and we use this fact to our advantage when attempting to get within gun range. We average about 55-60% success on this rifle hunt and most bulls are trophy class, ranging from 260-280 class, with numerous bulls each year reaching into the 310-330 class. This hunt is an 8-9 day trip depending on which camp were using, with 6 full days of hunting and as a full guided hunt is 1on 2; we also offer a semi-guided option, which is 1 on 4. Another great option on this hunt is for a hunter to pick up a general deer tag because this tag is good for one of the following: whitetail, mule deer, bear, or mountain lion. Roughly 30-40% of hunters will have an opportunity to take one of these animals during this hunt, and we do not charge anything to take one, so its a great option to possibly take a 2nd animal for free! There is a fly-in charge associated with the September rifle hunt, this rate changes from year to year and is paid directly to the aviation service upon arrival, which we set up for you. Our general rifle elk season in the wilderness area begins October 10th and runs through November 3rd. This hunt can be done one of two ways; we offer either a hunt out of our base camp lodge or a pack-in wilderness tent camp hunt. With the base camp lodge option you can drive directly to camp and begin hunting the following morning, and with the pack-in option you must add in a day to pack-in and a day to pack-out; both hunts offer 6 full days of hunting. Both options will in unit 12 within the Selway-Bitterroot wilderness area, and both offer as great of elk hunting as they are beautiful. The elk are still herded up this time of year, and the bulls are still bugling some, and we use this in part to locate the herd and try to pick out the herd bull. We average about 55-60% success on this rifle hunt and most bulls are trophy class, ranging from 260-280 class, with some bulls each year reaching up into the 300-320 class. We also offer hunters the option to pick up a general deer tag because this tag is good for a whitetail, mule deer, bear, or mountain lion. Roughly 30-40% of hunters will have an opportunity at one of these animals, so its a nice extra option to have. A hunter can harvest one of these animals at no charge at all, so its a very nice option to possibly take a 2nd animal on this hunt for free! 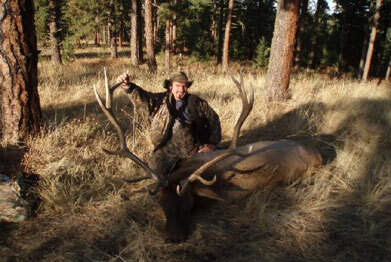 We offer an archery elk hunt that takes place in the Selway-Bitterroot wilderness area within unit 12. This hunt has 2 options; the hunt can be done out of our base camp lodge or out of a fly-in wilderness tent camp. This season runs the whole month of September, but we do most our hunts during the peak rut times around the 7th through the 21st of September. This is a full 6 days of hunting, and with the fly-in option we add in a day-in and a day-out. For the fly-in option you would have about a 30 minute flight out of a small town called Grangeville which takes you about 80 air miles into our Fish Lake wilderness camp. Both options offer a full-on rut bugle hunt in some of the most beautiful country in the state. The bulls are overwhelmed with rut activity this time of year and we take full advantage of that in order to get our hunters within striking range of a rut-crazed bugling bull. There is a fly-in cost associated with the fly-in tent camp hunt, this cost changes from year to year and is paid directly to the aviation service upon arrival, which we set up for you. Weve had some our closest calls on this hunt, with some hunters taking bulls as close up as 7 yards! Both the base camp and fly-in options are done by horseback and by foot. We offer both a 1 on 2 full guided option and a 1 on 4 semi guided option. We also offer hunters the option to pick up a general deer tag because this tag is good for a whitetail, mule deer, bear, or mountain lion. Roughly 30% of archery hunters will have an opportunity at one of these animals, so its a nice extra option to have. A hunter can harvest one of these animals at no charge at all, so its a very nice option to possibly take a 2nd animal on this hunt for free!